I've been doing a series of very simple portraits in an effort to focus on the line work itself, and not get caught up in the "Who is this supposed to be and what kind of scene is it" vibe. The point of these Sketches Of the Day is supposed to be simply to make myself draw every day, whether I'm mostly coding (like I have been this week), or even if I am drawing items for HM full-bore. But the larger reason behind that is to try to stretch myself, to hone the basic skills like line weight, mastery of the tool, and developing my own style. So I'll go through phases where I'm into a particular character or genre, but I'll also go through stretches like the current one where the important thing is not the subject, but the technique. So apologies if these are boring, and rest assured I'll be returning to super-hero stuff before too long. No need to apologize about drawings like this Jeff. I think its quite nice. Nothing wrong with a little variety. and it does do good to push your limits and boundries, where you don’t get stale or predictable. Could you, perhaps, in the future briefly explain the significance of line weight, for instance, or any other aspects of the art that you might be working with at the time? I for one would be interested, and maybe having to put it into words would give you insights for yourself. I know it would certainly be a LOT of work to draw the different angles and I imagine that most of the peaces would require reworking. etc. The rewards however would be exceptional and while I can’t speak for everyone, I am certain a great many would be willing to be exceedingly patient in waiting for that option. spidercow2010 (3): Good idea, spidercow. I’ll do that. Cliff (2): Very very very small chance that will happen. And if it ever does, it would have minimal item support like the Body Alternates — maybe a few heads or facial features, maybe body parts, but not clothing or headdresses or eyeglasses. Think about it — pretty much every single item would have to be redrawn to fit every view. There’s just no way I can do that much work in any way that makes sense to the user. Jeff, we are, I’m sure, all perfectly interested in seeing you do sketches of non-superhero, non-fantasy subjects as well. Many of us will never draw as well as you do so we like to see you expand your talent so our vicarious lives are all a bit more fulfilling. your talent with all of us!I think it is great that you are driven to draw everyday as a way of honing your skill.Variety of subjects shows just how talented you are.Keep up the great work! 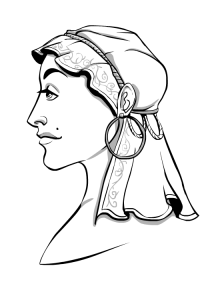 By the way, the lip should end in under the middle of the eye in a profile drawing. (Damn that art academy! It ruined my life!) by the way, this blog teaches me a lot. Thanks Jeff.